Hardback, 11.75 x 9.75 in. / 144 pgs / 70 color. Edited by Peter Bialobrzeski. Text by Manish Chakraborty, Florian Hanig. In nineteenth-century Calcutta, a wealthy Indian elite emerged under the rule of the British East India Company. For their homes, they built eclectic Bengali equivalents of industrialist mansions, which blended traditional Mogul architecture with more classical Western elements. Today these crumbling villas and palaces retain only a shred of their former splendor, and it seems only a matter of time before they will disappear for good. In this volume, 21 emerging photographers work with Peter Biaolobrzeski to capture the fading grandeur of this rich hybrid structures. 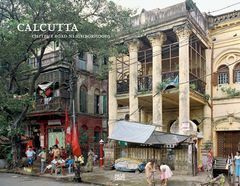 In 2007, Germany's respected daily newspaper Suddeutsche Zeitung commented, "If Calcutta had the appeal of Havana, its palaces would long ago have become the subject of various coffee-table books." At last, such a book exists. Essays by Florian Hanig and Christof Ribbat. FORMAT: Hardback, 11.75 x 9.75 in. / 144 pgs / 70 color.